Apollo Sprayers Announces Another “Industry-First! The PRECISION-5 NOW backed by a 5-year Limited Warranty! We paired the industry leading PRECISION-5 turbo paint spray system with an unprecedented 5-year limited warranty. It’s another Apollo Sprayers first – 5-year limited warranty on all PRECISION-5 models. Here’s why: Apollo is all about innovation and leading the market with design and quality. What better way to stand behind innovative cutting edge technology than with the industries best warranty. Apollo has designed patented features into the PRECISION-5 that increases the efficiency and motor longevity above all competitive models, providing customers with ultimate peace of mind. ApolloSpray systems are always designed with the best materials and workmanship in the industry. Apollo backs that up with award winning spray guns and customer service. You get the best of everything. To obtain your 5-year warranty on your new PRECISION-5 system you will need to register within 30 days of purchase on our website via our warranty registration page. The normal warranty on all ApolloSpray painting systems is 2-years parts and labor. 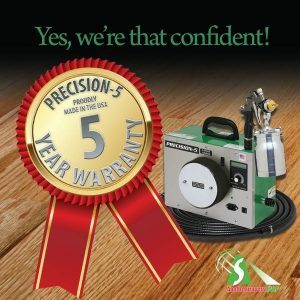 By registering your PRECISION-5 purchase on our website we will extend the normal 2-year warranty an additional 3 -years, giving you the original purchaser a total of 5-years limited warranty. And now our flagship system, the PRECISION-5 and our 5-year limited warranty! All PRECISION-5 turbospray systems manufactured by Apollo Sprayers International, Inc. are WARRANTED by APOLLO SPRAYERS INTERNATIONAL, INC. for a total period of FIVE YEARS on parts and labor, from the ORIGINAL date of purchase by the ORIGINAL PURCHASER. Proof of purchase to be included and all SHIPPING CHARGES to be pre-paid. APOLLO SPRAYERS INTERNATIONAL INC., upon examination of the machine/equipment will replace or repair at their discretion any defects in material or workmanship. This warranty is valid on the pre-condition that the equipment is used and operated in compliance with Apollo’s operations manual. This WARRANTY does NOT include: misuse, damage, neglect, alterations, disassembled equipment or modifications, lack of maintenance, cleaning, water damage to electrical parts, INCORRECT VOLTAGE CONNECTION. This Warranty is in lieu of all other express warranties, any WARRANTY implied by law, including but not limited to, implied Warranties of merchantability or fitness, is excluded to the maximum extent permitted by law and, if not excludable, is limited to the duration of the express Warranty. No representative or person is authorized to extend this Warranty or to create for APOLLO SPRAYERS INTERNATIONAL, INC. any other liability in connection with the sale of any APOLLO SPRAYERS product. APOLLO SPRAYERS INTERNATIONAL, INC. shall not be liable for any consequential, incidental or special damages of any kind directly or indirectly resulting from breach of any express or implied warranty. Some states do allow the exclusion or limitation of incidental or consequential damages or limitations on the length of any Warranty so that the above limitations and exclusions may not apply to you: however, to the maximum extent permitted under applicable law, the only rights and remedies shall be to obtain a replacement for any defective product. Make sure you register for your extended warranty on our registration page within 30 days of your purchase.